Unleash planetouched - now EVERY race can have the blood of chaos, heaven, hell, etc.! This deluxe-sized Star Log-installment clocks in at 17 pages, 1 page front cover, 1 page editorial, 2 pages of SRD, leaving us with 13 pages of content, so let’s take a look! All righty, so let’s take a look, all right? Aasimar get Cha+2, and choose a celestial heritage, which nets ½ character level resistance versus 3 energy types, as determined by 4 celestial subtypes to choose from. Aasimar have darkvision 60 ft., and, as a standard action, can shed light within 10 ft. – the interaction with magical darkness effects and the increased light level has been tied to either CR or item level, which is clever. Ganzi make a return, get +2 HP, +2 Con, Cha and -2 Int, darkvision 60 ft., and gain ½ level resistance to three energy types, depending on whether they are descendents of proteans or valkyries. They begin play with a planar oddity (more on that later) and may select Unlock Planar oddity as a replacement class feature at 5 of their levels. Ifrit get +2 Dex and Cha, -2 Wis, darkvision 60 ft, their level as fire resistance, as well as a +2 racial bonus to saves vs. fire-based attacks and effects. Ifrit can generate flashlight-bright balls of flame at will, and may 1/day as a standard action, infuse such a ball with destructive energy, making it behave as an incendiary grenade, with an item level equal to the character’s level. Oread get +2 racial HP, +2 Str and Wis, -2 Cha, darkvision 60 ft., their level as acid resistance and +2 to saves versus acid- and earth-based attacks and effects. They also get natural weapons, which may be enhanced when a mortal heritage would already grant them. Nice catch. Suli get +2 Str and Cha, -2 Int, low-light vision and may 1/day as a swift action shroud their arms in energy, which lasts for 1 round per level, and bestows their choice of the four base elemental fusions to their weapon wielded, which may be circled as a swift action. Nice one, and one that really wants to be expanded upon. They also get ½ their level as a resistance versus the 4 base energy damage types (i.e. sonic excluded) and +1 to saves versus such effects. Note that, in contrast to the oread, earth-based attacks are NOT included in that array. Nice, small way of differentiation there. Sylphs decrease racial HP by 2 (minimum 1), +2 Dex and Int, -2 Con, +2 to saves vs. air- and electricity-based attacks and effects, darkvision 60 ft., and when they fall, they can use a reaction and Acrobatics to fall safely, with the DC beaten allowing for lateral movement expansion. 5th level nets a 30 ft. supernatural fly speed with perfect maneuverability. Tieflings get +2 Dex and Int, -2 Cha, darkvision 60 ft., and these fellows get a planar oddity, and may, once more, select Unlock Planar oddity as a replacement class feature. They also get resistance equal to half their level (as always, minimum 1) to 3 energy types depending on the fiendish bloodline. Undine get +2 Dex and Wis, -2 Str, darkvision 60 ft. and are immune to environmental effects related to depth and pressure (I think this does not include depressurization) and don’t take penalties while fighting underwater; they can breathe both air and water and have a 30 ft. swim speed. They get +2 to saves vs. cold- and water-based attacks and effects. Now, I already mentioned planar oddities, so let’s take a look at those, shall we? There are two feats – one to Unlock Mortal Heritage (plus one racial trait from mortal heritage race) and Unlock Planar Oddity, which nets you, bingo, one planar oddity. Some oddities have prerequisites, and DCs to resist their effects are 10 +1/2 the character’s level + key ability modifier; skill checks to resist have a DC equal to 10 + 1.5 x character level + key ability modifier. The oddities include +1 to saves vs. afflictions, being ageless, change shape, change size, +1 AC, blindsense (accounts for type); there is an option to grant yourself a +1 AC bonus vs. projectile and thrown weapons. Squeezing due to malleable body; +1 caster level with a descriptor chosen and contingent on heritage; an inverse light decrease based on the aasimar ability; character level as DR, using water for a 1/day ranged maneuver, natural weapons, prehensile tail, 1/day force a foe to reroll a d20; sense through darkness, smoke, stone or water – and finally, skilled, speak with animals and vestigial wings can be found, as well as weapon familiarity. Minor nitpick: A few of these, the limited ones, seem like Resolve would have been a good call for recharge options, but that is just me nitpicking. Editing and formatting are very good on a formal and rules language level. Layout adheres to the series’ two-column full-color standard, with plenty of full-color artworks – one for each race, plus cover – that’s quite a bunch! The pdf doesn’t have bookmarks, but doesn’t necessarily need them at this length, though this does constitute a minor comfort detriment. Alexander Augunas’ planar scions are nice – they have a common baseline that I really enjoy; it makes them feel like parts of the same, grand facet, internally consistent. They are more distinct than I expected them to be, and the planar oddity engine is intriguing, allowing for further differentiation between them. The supplement also uses SFRPG’s peculiarities in smart ways. That being said, particularly the means to unlock specific parental race combos can be, system-immanently, something that GMs should keep an eye on. The wide open nature here can potentially result in potent combos, but the framework as a whole is solid – but it does unlock the concept for all races, which is AWESOME. Oh, and usually, I really dislike planar scions – this one, with all its customizing and unlocking them for other races? It makes them cooler, more diverse and frankly, what they should have always been. 5 stars. 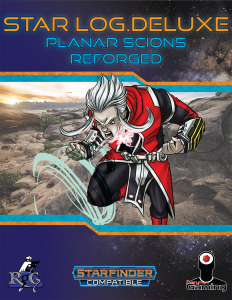 You can get these cool planar scions here on OBS!